My wife and I had an interesting conversation yesterday morning about the 11th hour. I believe we will be surprised with who’s in Heaven when we get there. Right? I mean, we all think: this person is holy and that person obviously is not or this person is saved and that person obviously is not. But scripture tells us another story. Let’s look at the cross. There were two thieves on each side of Our Lord that day. Now, you didn’t find yourself at the business end of a crucifixtion for nothing! Suffice it to say, these two were probably what we would consider “not holy” and definitely “not saved.” However, at the last possible moment one of them accepted Jesus into his heart and Jesus saved him! Talk about saved at the last moment! Thank God for that kind of Mercy and Grace, right? I don’t know about you, but I need it everyday! Quickly let’s also look at Jesus’s teaching about the 11th hour and “Idle-all-day” people (Matt. 20:2-16). Some workers work all day long and some only work for one hour, yet all were are paid the same amount. My favorite part of this parable is that the lord of the vineyard KEPT going out every hour to look for labourers! He looked for people who were idle… all day! Jesus will never stop! Even until the last hour of the day, He will search for you! 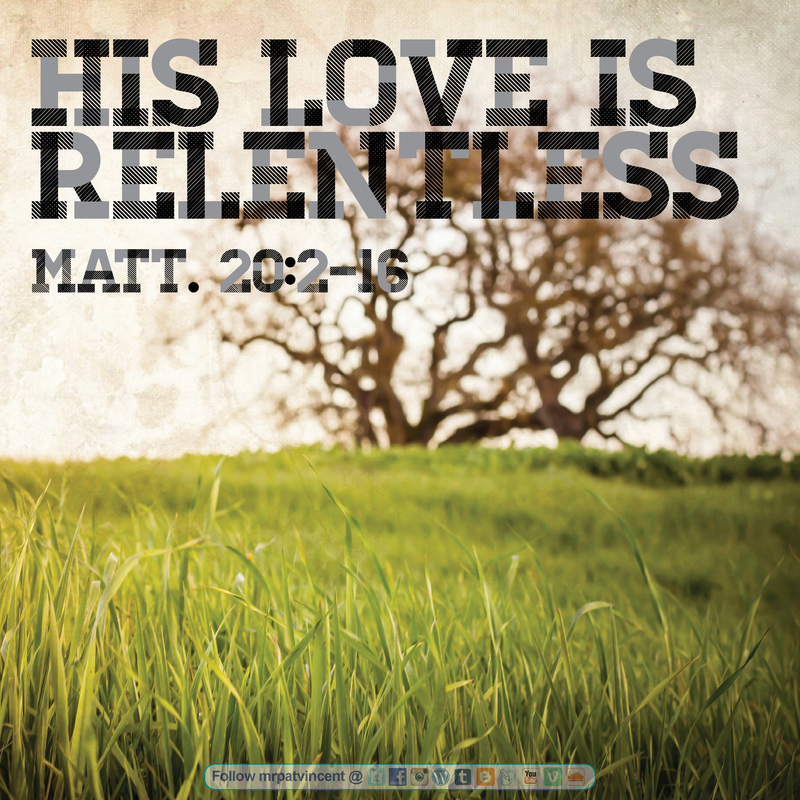 His love is relentless! In Ecclesiatetes 7:8, Solomon tells us better is the end of a thing than the beginning. I’ve ran marathons, that statement is very true! Sometimes it’s how you finish that makes the difference. Goal-setting resolutions can never match the unbelievable blessing of God’s divine intervention to have Mercy on us! So you see, it’s never too late. God is waiting on you, not the other way around! This entry was posted in Christian and tagged 11th Hour, Christianity, Divine Mercy, God, God is Love, God's love, His Love, His Love is Relentless, Holy Spirit, Jesus, Labourers, Love, Matthew, Mercy, Religion and Spirituality, Solomon, The Lord, Worship. Bookmark the permalink.